It's decidedly fall here. Leaves are turning and falling almost simultaneously. As much as I adore summer, there is something quite special about the smell and light and the feeling fall has. Borderline melancholic with a good dash each of wistfulness and hope - that's how I think of fall. With this new season there seems to be a shot at a fresh start. Plans to make. Pencils to sharpen. Out of summer la la land and into a deeper focus of what's important. Plus, lets not forget new TV season. (Homeland tonight!). In garden-land, things have quieted down considerably, and I'm happy for it. My evenings no longer have to be about watering and weeding and harvesting. Tomatoes are still on the vine and I watch the frost warnings like a hawk. There are a few roots left - the beets and carrots don't mind the chill and are quite forgiving of my neglect. It's put-the-garden-to-bed time, and what better way to use up the last of your hard work than with a big pot of soup bubbling away on the stove. See ya later, summer. Fall is my new best friend and I'm bringing it on with borscht. 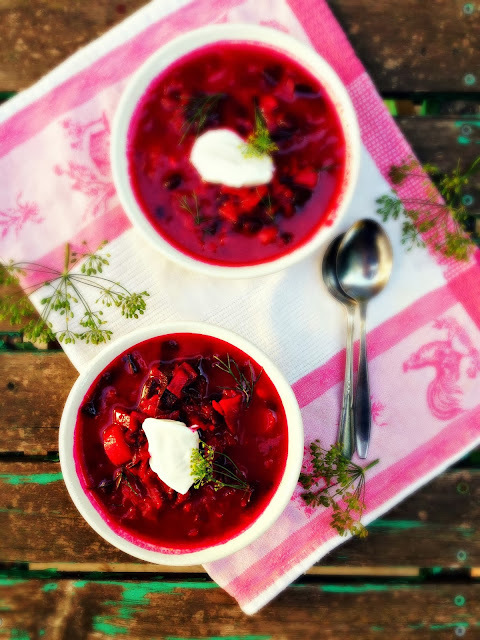 Borscht is one of those soups where you probably think you make it the best. Or your mom does. Or your grandma. And I'm not going to fight on you that. There are probably as many borscht variations as there are beets. But this is how I like it and I think it's pretty great. A couple of things. This one is vegetarian, but you could easily cook up chicken, beef or pork bones and use that as your base. I also add whole beets to the soup and remove them once they have cooked and then shred them. I think this saves a little time and a bit of mess and amps up the flavour. Lastly, I added black beans at the end. There is probably a Baba out there shaking a finger at me. How dare you add beans to borscht? But there is also another Baba who would give me a high-five. The beans increase the nutrition and I like the flavour. If I were using beef bones, I'd add the meat, too. Borscht is one of those soups where you can do whatever the heck you like. Leave out potatoes or double them up. Don't like cabbage? Don't add cabbage! I added the beet greens at the end, only because they looked lovely and I hate throwing out food. But let's face it. 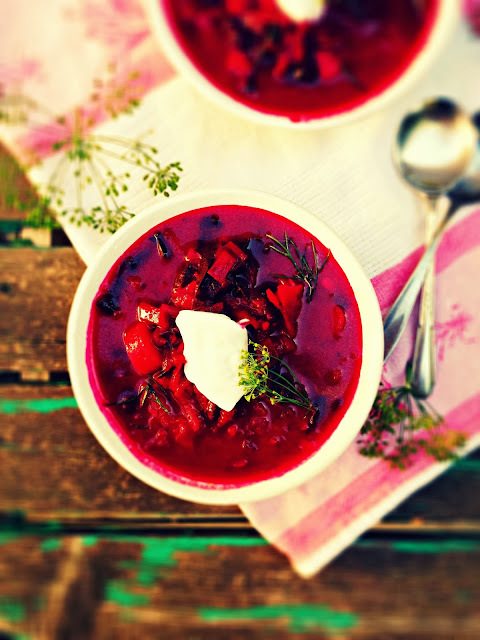 Borscht isn't borscht without the generous dollop of sour cream. And a good dose of dill. One of the prettiest soups, each empty bowl is almost a masterpiece. Happy autumn, friends. Heat oil in large soup pot. Add the carrots, onion and garlic. Cook until tender, about 5 minutes. Add the cabbage and potatoes and cook 5 minutes longer. Add the diced tomatoes, tomato paste and broth. Stir well. Add the whole beets. Bring to a boil, simmer, covered for about 1 hour. Remove beets, let them cool, then shred them. Add to the soup, along with their juices. Stir in the cooked beans, vinegar, paprika, honey, salt and pepper and beet greens. If too thick, add more broth. Simmer 5 more minutes on low heat. Stir in dill. Adjust seasonings. Serve into soup bowls and garnish with a healthy amount of sour cream. Serves 6 to 8. Recipe adapted from Cinda Chavich's book High Plains. You know, I've never cooked Borscht! It's so interesting to read your take on the soup here, because Borscht is alien to me. 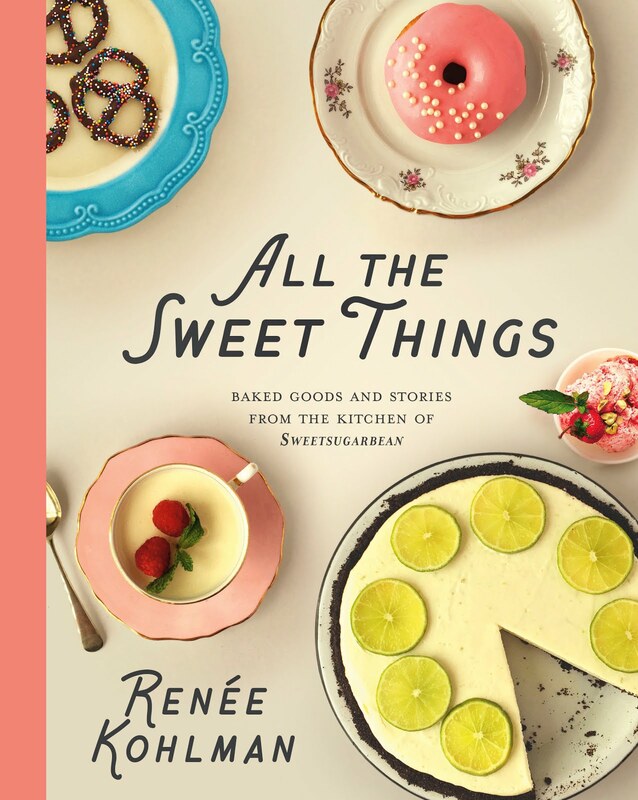 I really must give it a try, though, and I love the idea of beginning with the Renee version! Happy fall! oh - i do love borscht! from the early summer soup made with teeny tiny baby beets cooked whole and decorated with their tiny sweet leaves and sour cream to the late fall soup made with maybe only ONE giant beet...always lovely! and you are very right about the empty bowls - works of art! 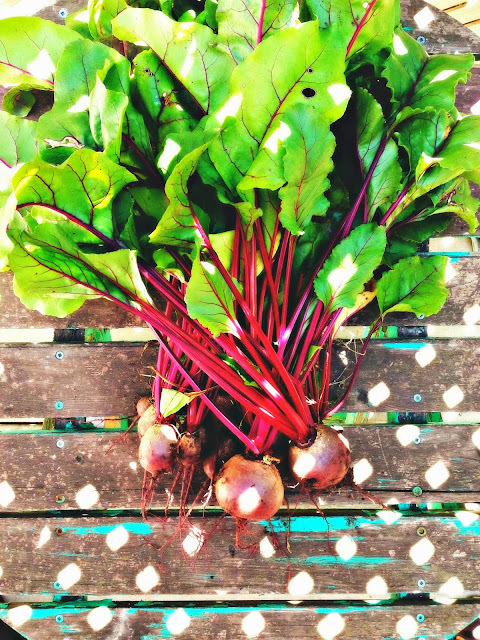 Renee, I'm a total beet lover and have to applaud those gorgeous beets from your garden! What beauties. And I love that you use the greens in your borscht. Welcome fall indeed. I tried this as my first time making borscht. I didn't have dill, I used red norlands instead of yukon gold, didn't use sour cream, didn't use tomato paste but a squirt of ketchup, and served it hot and chunky. 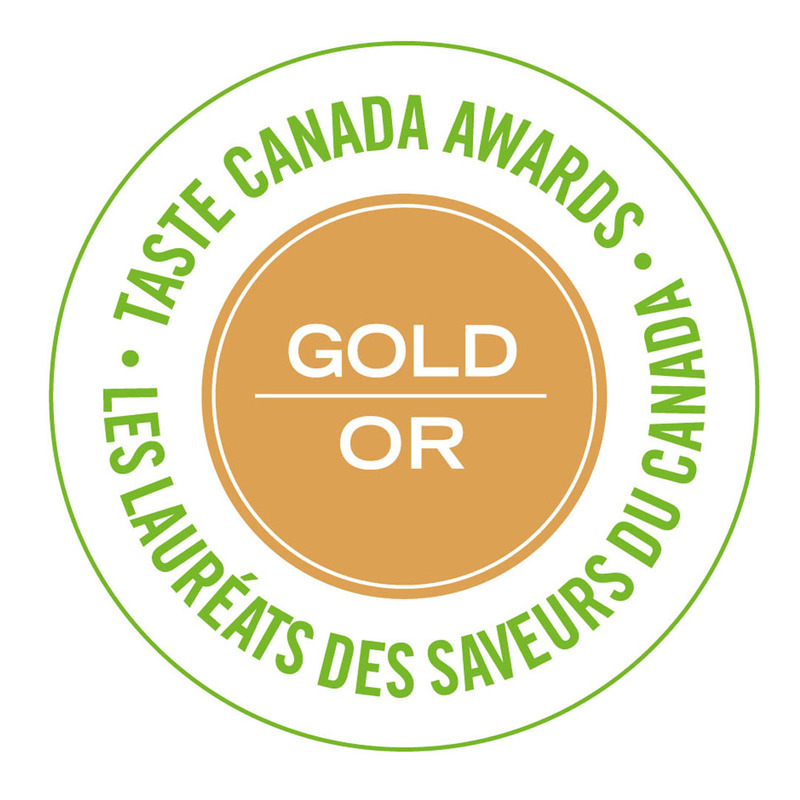 I thought it was a little salty and sweet while also being quite savoury. Boyfriend said it tasted a lot like beets. I had it with a beer and ate 3 bowls of it. Delicious and really not hard to make at all! Jess - thanks lady. Happy fall to you too! Molly - beets really are the best. Thank you! 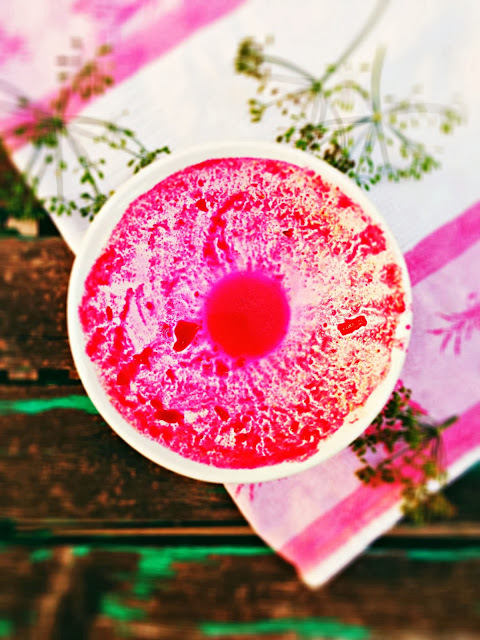 When I saw this recipe I thought 'Why didn't I grow beets this year?' Looks delicious! Thanks for sharing your the #beetlove! And I absolutely adore your delicious food photos on Instagram! I just made borscht but a little bit differently, without beans and its also vegetarian. But yours looks delicious and I will have to try it!